Many marine animals suffer the consequences of human activities and their lives are in danger. The same happens with manta rays, which are about to be considered endangered species. In a way, because they remain in the “vulnerable” category of the Red List of the International Union for Conservation of Nature (IUCN). The giant manta ray (Manta birostris) and the reef manta ray (Manta alfredi) are threatened by a number of factors of anthropogenic origin rather than natural causes. Its few natural predators such as large sharks and killer whales do not usually attack often, but humans are almost always involved in the injury or death of these fish. This is particularly negative because manta rays have a slow reproductive rate, i.e. they usually birth only one or rarely 2 offspring and births occur every 2-5 years. In this sense, the disappearance of many populations or individuals affects rapid recovery, so the number of manta rays continues to decline every day as part of an untenable situation. What has caused this situation? The primary threat is fishing in any form, whether incidental or directed. The fishing industry is the basis of many human populations, and fish is a widely eaten food around the world. So, many oceans are filled with nets waiting for species to come inside to be captured. Sometimes manta rays also come without fishermen intending to catch them. Once inside the net, manta rays can injure or suffocate because it becomes difficult for them to obtain oxygen from the water. It is very unfortunate that some species as these become victims of bycatch, as their commercial value is very low. Their flesh is underappreciated because of its sandy texture and unpleasant taste. However, some people use them as bait to catch other animals such as sharks. Directed fishing is more complex. Fishermen do not want them for their meat, but for the gill rakers that are in their gills and naturally serve to filter plankton. These gill rakers are demanded and used mainly in traditional Chinese medicine to produce remedies for various diseases, including chickenpox and cancer. However, there is no scientific basis to endorse the effectiveness of the remedies, so in this case the capture and killing of hundreds of manta rays (in some regions may be more than 1,000 a year) would be in vain. Isn’t that terrible? -Deterioration/destruction of their Habitat. 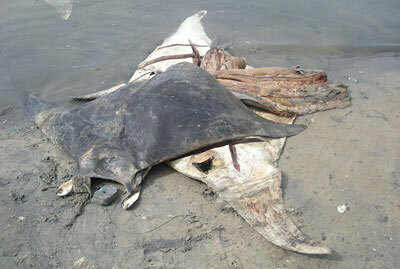 It is a common problem not only on manta rays, but that affects them nevertheless. Pollution of their water and waste directly affects their health, and they are particularly vulnerable to get entangled in fishing nets segments which causes them painful injuries. In some areas it has been found that a large proportion of individuals exhibits scars caused by nets and even still show parts of the material. – Global warming. Rising global temperatures affects the increase in water temperature, which causes a rise on the sea level, water acidification and changes in geographic range, behavior and feeding of the species. It can also affect the availability of plankton, the main food of manta rays. – Collisions with ships. These, by their weight and size, can injure or kill individuals who are feeding near the surface. Collisions often happen in areas where several manta rays gather. – Unregulated tourism. It is increasingly worrying, and it’s that the large number of tourists who want to know these fish increases and they may result disturbed. This happened in Bora Bora, where the population of manta rays left the place, apparently, because of excessive tourism.